Wow. Last week’s MarTech Conference was an awe-inspiring two and a half days for me. I am immensely grateful to the 29 speakers, 67 exhibitors and sponsors, and over 1,100 attendees who joined together in San Francisco to share their experiences and ideas on the state of marketing technology. 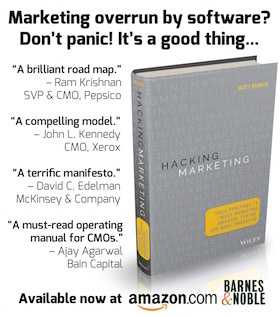 It is springtime in martech, and I was a marketing nerd in heaven. This second MarTech event grew more than double the size of the first, which was barely 8 months ago. I believe that geometric growth reflects the accelerating momentum and energy that we see across the entire marketing technology space. It’s not just about the steady expansion of the vendor landscape — although that’s certainly one dimension of this blossoming field. More exciting, to me, is the proliferation of hybrid professionals who are synthesizing the worlds of marketing and IT to forge a new kind of marketing discipline: marketing technologists. To appreciate that juxtaposition, note that the far majority of the presentations at MarTech were not particularly technical in nature. They did assume a “graduate level” understanding of digital marketing technologies. But most of the speakers focused on new ways to apply those technologies for better customer experience design and delivery, for software-powered storytelling, and for better marketing management practices. They were all marketing topics. But they assumed a level of technical sophistication in how they approached those topics that you wouldn’t hear at your typical marketing conference. When one of the presenters asked the audience to raise their hands if they had ever done any software programming, the far majority did. That was an earth-moving moment. It’s an emerging field because, as a percentage of people working in marketing and IT, these hybrids are still relatively rare. But they’re multiplying, rapidly. And, as was clear from all the fascinating discussions everyone had at MarTech last week, this is a big part of the future of marketing. As we charge into that future, there’s so much to learn, discover, and invent. 1. Creative tension is a powerful engine. Thomas Stubbs, the global IT leader of digital marketing at Coca-Cola, described a series of digitally-powered World Cup campaigns that the company had run over the past decade. Their evolution from 2006 to 2014 was fascinating. In the early years, the projects had been managed with supposedly predictable “waterfall” design — yet the stress leading up to the night before launch was overwhelming. By 2014, however, they built everything using agile methodologies — and safely finished weeks in advance of the deadline. But my most important takeaway from Thomas’s talk was the philosophy of agile that they emphasized: having all the different parties involved at the table throughout the project. In particular, they had two agencies — a German creative agency and an Austrian technology agency — that has recently “divorced” (they used to be one combined agency). There was certainly tension between them at times. But that actually had a beneficial effect. It gave each party the opportunity to fully represent their perspective and expertise — surfacing issues earlier, rather than later. And it pushed everyone as a multi-disciplinary team to develop a truly shared vision — not merely the illusion of a shared vision that can sometimes occur when one party dominates. It was a beautiful example of collaboration in a world beyond the classic IT/marketing divide. 2. Agile principles and practices are the heartbeat of modern marketing. Many of the speakers at MarTech shared examples of how they had incorporated aspects of agile and lean methodologies into marketing. Jeff Gothelf, author of Lean UX, stressed the need to accelerate the pace of organizational learning, through a powerful combination of customer-centric experimentation, data-informed iteration, and humility. He noted that Amazon now pushes updates to their site every 11.6 seconds, which elicited several gasps from the audience. That, by the way, is a perfect example of the kind of operational capability that a marketing technologist can really appreciate. Mayur Gupta, the global head of marketing technology and innovation at Kimberly-Clark, who spoke later that afternoon, referred back to that revelation with awe as “the goal” that we should all be striving for in our digital experience agility. Fred Gerantabee, SVP and Director of Creative Technology at Grey Group, walked the audience through what technology-powered marketing projects look like from the agency side — also with a strong emphasis on agile processes. He illustrated the power of prototyping to quickly give ideas life in the brainstorming process, to let stakeholders touch and feel experiences much earlier in project lifecycles. 3. In an automated world, doing things manually (initially) helps you understand them. Corey Craig, the experience design and innovation lead at Dell, gave a fantastic presentation on designing and operating “always on” marketing programs at scale. She described how they sketch out experiences, break them down into discrete moments that they can identify with data, map those moments to modular content repositories, and derive logic for orchestrating that flow. One of the things that fascinated me in her presentation was her emphasis on starting with manual processes, to walk through each step by hand, to really understand the dynamics of customer interactions before automating them. She’s a big advocate of then visualizing the logic across those relationships on paper or whiteboards, to be able to explain what’s actually happening. 4. Develop new marketing systems — not just marketing executions. The importance of developing good frameworks was also driven home by Patrick Spenner, managing director of CEB. Pat said the fundamental challenge that marketers are facing is the widening gap between legacy marketing systems — not just the technologies, but also the people and processes intertwined in such “organizational systems” — and consumer expectations. To address that challenge, it’s not sufficient to run exhausting, one-off sprints of brilliant digital marketing executions. It’s important to develop a more sustainable solution. Pat described that solution as a shift from treating marketing as one big orchestra that plays a symphony to multiple teams that play jazz. They experiment and adapt, but they don’t just do one-offs. Instead, they build in the evolution of new systems as they go along. They actively look to break down outdated structural silos and replace old processes. 5. Move beyond “journey mapping” into a front-stage/backstage service blueprint. Jeff Cram, the chief strategy officer of ISITE Design and a marketing technology mythbuster, stated the discontinuity that we so often face today — many marketers are saying the right things, (“customer obsessed”, “360-degree view of the customer”, “differentiate on experience”), but the reality of what they’re doing falls short (“our digital experiences aren’t coordinated across channels or silos”, “personalization is the phase two that never comes”). But as an enthusiastic marketing technologist, Jeff believes this is our collective opportunity. As one approach to closing this saying/doing gap, Jeff recommended moving beyond customer journey mapping — which simply defines the customer’s progression through the different stages of the buying process and what they do and expect at each point along the way — to more of a service design blueprint. The field of service design, which was pioneered by Dr. Michael Erlhoff, treats the customer’s view of their journey as only one layer of a more complete organizational architecture that includes front-stage actions, back-stage actions, and support processes. This integrates thinking around people, content, processes, and platforms right from the outset of designing customer experiences. 6. The real growth from marketing technology will arise in how we creatively use it. Gerry Murray, research manager at IDC, gave one of my favorite presentations of the event, Leaps of Imagination: Creativity in a Data and Process-Driven World. In Gerry’s view, the returns from technological innovation itself ultimately peter out — in the end, everybody gets the same technology. Analytics can help squeeze out more performance at the next level, but then, that too, hits a wall. To really beat the pants off of your competition, you need to be more creative than they are. Marketing technology simply enables a whole new scale of creativity. Gerry gave examples such as Pizza Mogul, the real-life pizza empire building game from Domino’s Pizza in Australia (“why can’t our social media game have real pizzas?”) and the #WantThatHair social media campaign by Pantene that stole the 2013 Oscars — without spending a single dollar as a sponsor (“could we do something big that doesn’t mention Oscars, or the academy, or celebrities, yet still steals the show?”). 7. Marketing automation is engineering, and MarkOps is the new DevOps. Isaac Wyatt, who manages marketing operations at New Relic, illustrated the parallels between software engineering and marketing automation — and between DevOps and the new generation of MarkOps (marketing operations). Indeed, in Isaac’s comparison above, it’s probably easier to read the decision logic of a marketing campaign in pseudo code. Given the complexity of ever-more-sophisticated multi-step campaigns and behaviorally-triggered decision logic in marketing automation — as in the example here — it’s helpful to manage these programs like software programs. Otherwise you end up with the equivalent of “spaghetti code” in your marketing: it’s impossible to debug or hand off from one manager to the next. There’s a tremendous opportunity for modern MarkOps professionals to establish the best practices and frameworks for taming this complexity — and nudging marketing technology vendors to better support them in that mission. 8. A big, new wave of multi-billion dollar marketing technology companies is coming. One thing that became abundantly clear in my fireside chat with venture capitalists — Neeraj Agrawal of Battery Ventures, Ashu Garg of Foundation Capital, Ajay Agarwal of Bain Venture Partners, and Brian Andersen of LUMA Partners (not a VC, but the leading investment bank in the space) — the race for who will become the “giants” in marketing technology is not over yet. All of them are investing heavily in a new generation of platforms. What will those platforms be? Most of the participants emphasized the degree to which social still has tremendous potential to be better integrated into organizations, offering new ways to reimagine how platforms could facilitate that. David Raab, who gave an amazing presentation on customer data platforms, a marketing technology category that has really taken flight over the past couple of years, offered another perspective (perhaps complementary): there’s tremendous demand and activity happening at the “decision” layer of his data-decisions-delivery model. This includes things like predictive models for scoring and retention, dynamic message selection, and multi-step campaigns. These decision-layer platforms have the potential to pull from many different data sources, eventually in real-time, and support a multitude of emerging delivery channels. 9. The most advanced marketing technologists look at the world through APIs. Tony Ralph, the director of ad technology at Netflix, described how their team took a “buy or build” decision for their digital advertising capabilities (ad server, demand side platform, and an underlying data engine for performance and attribution) and turned it into a “buy AND build” philosophy. Some components they buy off the shelf to get turn-key capabilities and tap external expertise; others they build in-house to have completely customized control over the data, workflow, and feature prioritization that they see as essential to their competitive advantage. Tony will only work with a marketing technology vendor if they can provide full APIs — ideally, their product uses a service-oriented architecture built around those same APIs. He also expects them to expose event-level data, share their technology roadmap, and offer fully self-service options. This gives Netflix the ability to weave those products into a more specialized marketing engine that is uniquely crafted to their business. Isaac Wyatt of New Relic also echoed the importance of APIs. When I asked him what was one message he wanted to send to the marketing technology vendor community, he replied, “APIs. APIs. APIs.” This next generation of marketing technology platforms would be well-served to heed this call. It gives them flexibility. It gives their customers flexibility. And with expanding marketing technologist talent in the world, there’s a growing community that can really take advantage of it. Whew, this is 2,000 words, and I’ve barely scratched the surface of the event. So I’m going to wrap this up for now. But I’ll be back with more soon. Almost all of the presentation slide decks are now available on SlideShare, if you want to flip through them. Hopefully we’ll have some videos to share with you soon too. Of course, to really capture the firehose of information and insight from an event like this, you need to actually attend the conference! Seriously, if you’re enthusiastic about how marketing technology and marketing technologists are remaking marketing as we know it, you should really come to one of the next MarTech events. We’ll be in London for MarTech Europe on October 20-21, 2015 and then back in San Francisco for MarTech North America March 21-22, 2016. Mark your calendars! P.S. Once again, that Microsoft acquisition thing was an April Fool’s joke. Next Post A 2-sided silver bullet for marketing and sales alignment? Great summary of what sounds like a fantastic event. Wish I was there — and bravo on doing something important and timely for the market. Great coverage, Scott! I would have loved to have been there — especially to see John Maeda (huge fan) and to swoon at this line alone: “Marketing technology simply enables a whole new scale of creativity.” Love. That. Congrats on what looks like a successful event! Great overview Scot, what a great event, you and the rest of the team are really helping to push marketing forward here. Wish i had been able to be there, but Sydney is a long way from SF. Maybe next time, it certainly seems to becoming one of the “unmissables” on an increasingly crowded calendar. Hi. Thank you a lot for this terrific conference experience. It was absolutely worth it to travel all the way from Germany to San Francisco. The quality of talks, discussions and vendor demos was levels higher then on any other conference I attended before. Thank you, Bastian. I’m really happy you enjoyed the conference! Great conference, Scott, and agree with this list of nine takeaways, though I’d add two more quotes that are two different sides of the same coin – CIO/CMO alignment. Forrester’s Laura Ramos nailed it for me when she suggested that the first and most critical place for CMO’s and CIO’s to align is at a common understanding of the customer experience – and then Isaac Wyatt asserted that “marketing ops is dev ops,” which is particularly increasingly the lens the CIO will apply to understanding and supporting generally agile operations, so again, a key area of alignment. Congrats for putting on a really informative event. Great, conference Scott. Thanks for pulling it all together! There were some really insightful talks throughout and I loved the diversity and different perspectives all the speakers brought to the table. Looking forward to the next one and will keep up with your blog in the meantime, to satisfy the MarTech cravings! This was a very good round-up — thanks Scott. It is a very interesting time to be in the marketing technology space: we’ve been witness to a chaotic big bang of categories, vendors, and tactics, and yet reading your take-aways, I can gradually see the outlines of an more orderly marketing universe emerging. It seems one where creativity and data/technology are complementary and mutually supportive. And one where marketing acquires the operational and organizational rigour to produce measurable, scalable, repeatable results across the customer lifecycle. Many good insights here but particularly appreciate the metaphor of marketing team as a collection of jazz bands experimenting and iterating, and the recognition that marketing automation is in fact engineering with a graphical interface — and the need to have “good code” in your MA system. Again, it’s a very interesting industry to be part of it right now. Marketing automation certainly is engineering. I certainly am looking forward to new platforms.